Temple Slots Casino is offering amazing bonuses for new players. Sign up today to receive a welcome bonus of up to £150 and 150 free spins across your first three deposits! Join now and start your journey through the Aztec Temple searching for antique treasures! *First 3 deposits only. Min dep £10 (£20 3rd Deposit). Max cumulative bonus £150 and 150 spins. Bonus match amount and spins game eligibility vary per deposit. 50x wagering on Deposit + Bonus, 50x on bonus spins, 10x max conversion, £5 max bonus stake. Full T&Cs Apply. Temple Slots is a brand new casino launched in 2018 and they understand that in order to compete, they need to offer some generous bonuses to new players. Plus Temple Slots offer running loyalty bonuses, which change over time and can include… more free spins, cash bonuses and no deposit bonuses. The special VIP area also opens up for regular loyal players with new games and a priority service. Temple Slots Casino provide hundreds of betting options provided by many of the best software providers out there, including NetEnt, Microgaming and IGT. The games are laid out on the Home page for the players convenience but you can also choose to list them based on different criteria. From hot favourites like Gonzo’s Quest to new games such as Archangel’s Salvation, there are a huge range of slot games to keep you entertained. Temple Slots take customer service seriously and make every effort to stay in touch with their customers via email, Live Chat and telephone. 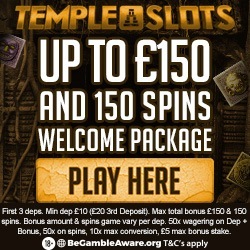 Temple Slots Casino are offering an amazing welcome bonus for new players who click on the button below and sign up. All new players will receive a welcome bonus of up to £150 and 150 Free Spins across their first three deposits. Free spins are available across Gonzo’s Quest, Finn and the Swirly Spin, Starburst and Aloha. Sign up via the Big Bonus Bingo button today to take advantage of a great welcome bonus from the new Temple Slots Casino site. Giant Spins Casino: 100% match & 25 Free Spins!